The International Community Foundation did a study of “U.S. retirees over 50 years of age that are residing part-time or full-time in Mexican coastal communities” Residents residing in the coastal areas of Puerto Vallarta, the Riviera Maya, Cabo San Lucas, Rosarito, La Paz, Loreto, Puerto Peñasco, and smaller villages along Mexico’s far-reaching shoreline participated in this survey. 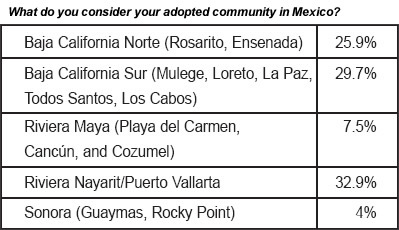 The survey singled out the key reasons for why retirees chose to move to Mexico. The top factors for moving to Mexico for retirement were lifestyle, cost of living, weather, and closeness to the U.S. Another factor for moving to Mexico’s coastline is the abundance of recreational activities available around the water: fishing, swimming, surfing and boating. More than 70% of retirees can afford a comfortable lifestyle with an annual income over $25,000 which is more than double the average per capita annual income of a Mexican citizen at $11,410. Read more here from International Community Foundation for interesting insights from into the rapidly growing US retiree - Mexico relationship. 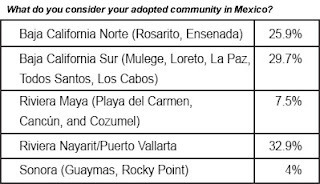 ICFDN: Riviera Nayarit tops the list of communities to move to in Mexico.